Well in the case of my blog, the egg salad recipe, but I actually created the chicken salad first. This is another great alternative to a boring sammie and I actually recommend you eat it sans bread only because there are so many good flavors you should enjoy! Tip: Making with 3-4 chicken breasts will give you enough for 3-5 servings depending on how hungry you are — easy lunch for a few days that week or lunching with the ladies. Preheat oven to 425 degrees. Lay the 3 chicken breasts on a cookie sheet with sides. Spread a thin layer of dijon on both sides of each chicken breast, then sprinkle with dill and crank a little whole black pepper on both sides. Put the chicken in the oven for 10 minutes. After 10 minutes flip each chicken breast and return to the oven for 10 more minutes. Remove and let cool. Meanwhile, dice celery stalk. When chicken is cool, roughly chop into bite sized pieces and add to the bowl with celery. 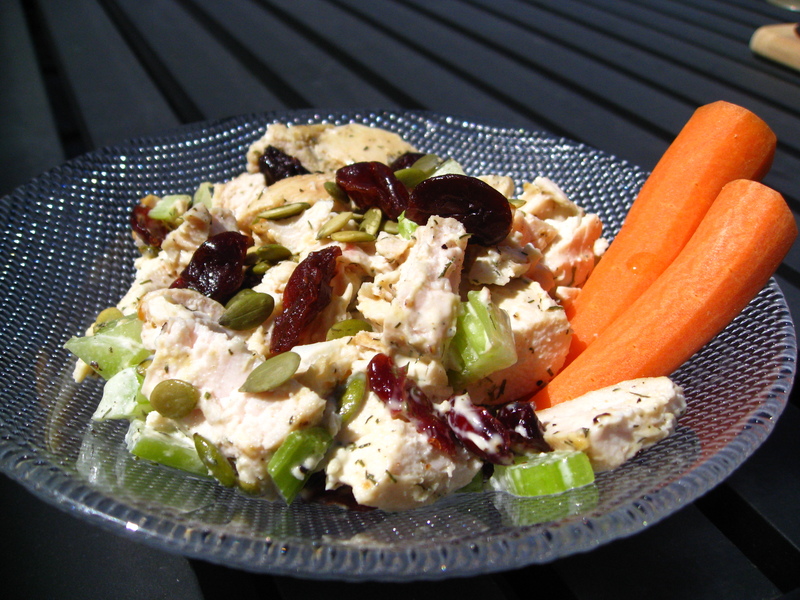 Add dried cranberries, sunflower seeds, a dollop of mayo and dijon and another crank or two of black pepper. Toss to mix ingredients thoroughly and enjoy. This is another great salad to sprinkle a few radish sprouts on top for an surprising fresh, peppery flavor. As the sole benefactor of this delicious chicken salad, I have to say it was even better than it looks! I am making this ASAP. It looks soooo good! Great blog – proud to know ya! Malia and I just made this the other day and it was deeelish! We didn’t have any celery and I wasn’t about to buy a whole thing of it. Which makes me wonder why they don’t sell celery by the stalk? Anyways, the dijon gave the perfect kick and the cranberries added the perfect amount of sweet. We had it on top of a salad and then I made a sandwich out of it the day after. What’s the next recipe! ?